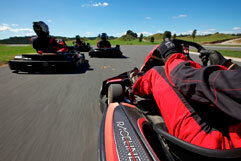 Experience New Zealand’s best karting adventure at Off Road NZ, Rotorua. Test your courage and driving ability like never before when you race New Zealand’s newest and longest A-rated KartSport circuit, at Off Road NZ, Rotorua. Feel the anticipation as you suit up, pull on a helmet and prepare to race one of our state-of-the-art, 4-stroke 390cc Sodi karts on our Rotorua International Kart Sport Raceway. 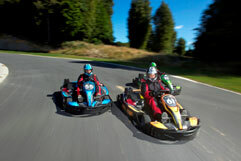 Experience the sensation of ground rush as your kart reaches up to 100km/hour on the 150-metre straight. Tyres squeal and G-forces pull as you take on hairpin corners, flowing curves and long straights that demand intense concentration and skill… while all around you, other competitors rival for your position. Duration: Track time 10 minutes, whole experience approx 30 minutes. Tune your skills with a 10 minute 'Fastest lap' qualifying session, followed by an adrenaline fuelled 10 minute race against your colleagues. The driver who passes the chequered flag with the most laps wins! Tune your skills with a 10 minute 'Fastest lap' qualifying session, followed by an adrenaline fuelled 20 minute race against your colleagues. The driver who passes the chequered flag with the most laps wins! Tune your skills with a 10 minute 'Fastest lap' qualifying session, followed by an adrenaline fuelled 30 minute race against your colleagues. The driver who passes the chequered flag with the most laps wins! up the highest number of laps within the time wins! Bookings are essential for these formats.